If you are at Birmingham airport and looking for some last minute essentials or a souvenir to take home, World Duty Free group stores at the airport is there to find it. You can buy perfume, watches and many more from Birmingham airport duty free shops. The stores offer you ultimate shopping experience with over 17,000 products on display. Hundreds of travels exclusive which you find there are hard getting somewhere else. At the heart of the UK motorway network, Birmingham Airport is accessible to up to 35 million within 2 hours driving time. You can reach the airport by train, bus or a coach, taxi, car, cycle or even on foot. Directly connected to Birmingham International Station by a free ‘Air-Rail Link‘ system, it just takes two minutes to reach the station. The airport offers great amenities and facilities which include car parking, lounges, travel money, express lane security and more. You will find a range of products at Birmingham duty free shops which include fragrances, liquor, confectionary, designer cosmetics, bags, travel essentials and lot more. You can buy all that at tax free prices. It makes you feel that your trip starts right at the airport! Be it holiday outfits, swimsuit or something else for men, women or kids, you will have a range of products to select from. You will find high street fashion and designer brands with latest fashion and trends which includes Superdry, Next, Victoria Secret and more. At Huge Boss, you will find an extensive business and leisurewear collection of menswear. At JD Sports, you get sportswear where you can buy top brands polo shirts, t-shirts, hoodies, jackets, trainers and shorts. It happens that you forget couple of the travel essentials to carry for your trip away, but you don’t worry. Boots offers you wide selections of travel essentials including toiletries, pain relievers, vitamins, and allergy tablets, adaptors, mobile phone chargers, speakers and lot more. Birmingham Airport has a number of outlets for accessories needed for your new holiday attire. At The Fashion Palace, you will find bags and small leather goods by Guess, beautiful jewellery from the world famous Swarovski and accessories at tax free prices. 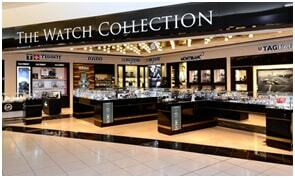 You will find a range of watches and accessories at The Watch Collection. You will find top brand time pieces which include Tag Heuer, Mont Blanc, Longines, Tissot and more. You can find high street fashion jewellery at affordable price at Pandora. Recently sunglssess special shop Eye Love has been added to the shops where you can shop designer sunglasses from popular luxury brands including Ray Ban, Karen Millen, Burberry and more. At Dixons Travel, you will find the latest cutting edge technology gadgets such as Laptops, iPads, iPods, tablets, Kindles, Camera, Speakers, camera lenses and lot more. Enjoy ultimate shopping experience at duty free shops at Birmingham airport!